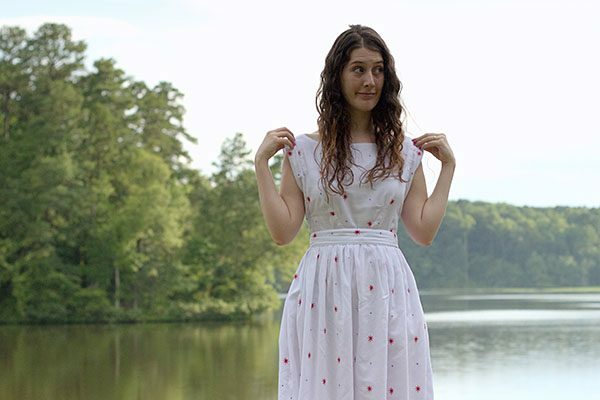 As I was saying last week, my biggest fail of the year was this Chiara dress I wore on the 4th of July. A little bit of context to start: every year, for the 4th of July, I try to sew a red, white and blue outfit to celebrate (in previous episodes…). 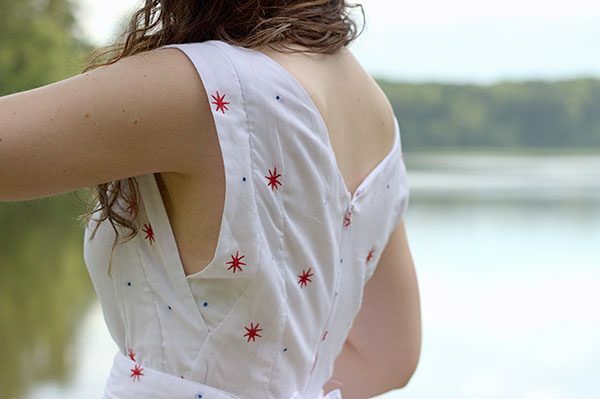 In 2017, I had set my sights on this white fabric embroidered with red and blue starts, and the Chiara dress from Wear Lemonade, a brand of patterns I hadn’t tried yet, despite having subscribed to their PDF club for a few months. Unfortunately, after several long evenings struggling to finish it on time, I thought it was such a disaster that I abandoned it with only the zipper left to insert. For July 4th 2018, I decided to take it out from the back of the closet and finish it to be able to wear it at least once, and talk about it here! However, sewing-wise, when you look at it up close, you realize that the fit of the garments on the models is not that great. 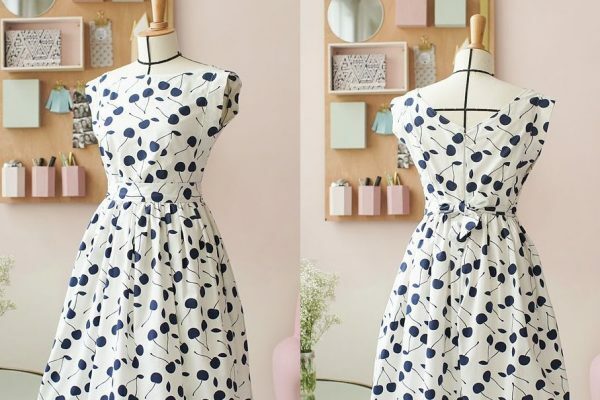 It gapes at the necklines and armholes, the bodices are too long or too wide… I think that’s what turns me off about Wear Lemonade: it’s a ready-to-wear brand first, and a sewing patterns brand second. Therefore their clothes tend to have a very read-to-wear fit: slightly oversized and cinched with a drawstring or belt, instead of properly fitted. Another thing that bugs me is the lack of pictures showing the garments clearly. On the pattern pages, you only have the line drawing of the front of the garment, sometimes a picture on a hanger or dress form (which I don’t recall being there back when I downloaded the pattern), but nothing showing the garment on a body. 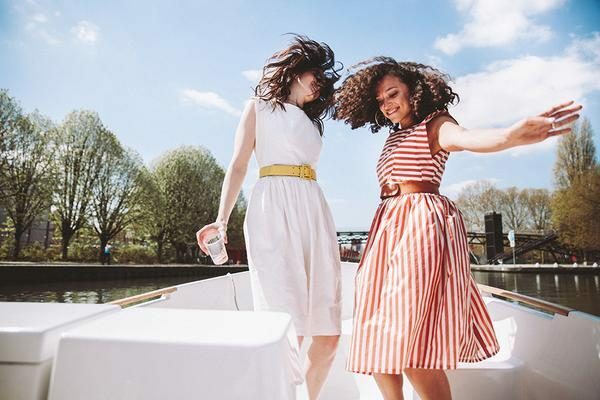 To find those, you have to dig deep on the internet to find the clothes sold for the various Wear Lemonade ready-to-wear collections, which are often gone if the pattern is a little older. And don’t even think about finding a picture showing the back or side (which is particularly unfortunate here since the armhole detail on the side of Chiara is my favorite thing about this pattern!). With all this I couldn’t quite figure out how the dress would turn out. 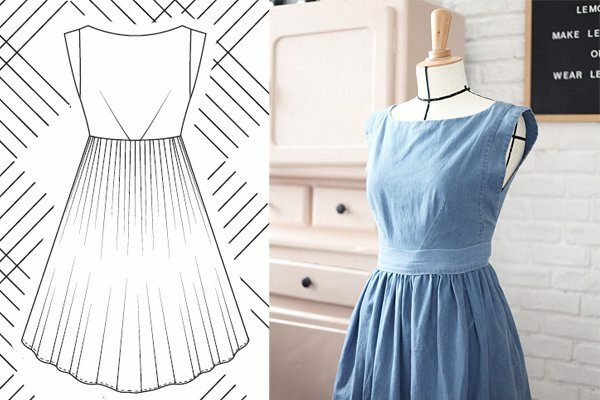 The line drawing (above, left) showed a bodice stitched directly to a gathered skirt, but the finished garment picture that I had found on social media (above, right) looked like there might be a waistband in the middle. The picture in the instruction booklet (below, left) wasn’t helping much either, but thankfully I ended up finding the corresponding picture of the back of the dress (don’t ask me where, it took me forever just scrolling through Google Images) and I understood that it was a fabric belt on top of the dress, knotted in the back. With that mystery solved, I started putting the PDF pattern together. It is huge: 43 pages to tape together. And only once I had finished the whole thing I realized that the skirt and skirt lining pieces are strictly identical rectangles. I’m good with having to print and assemble a rectangular pattern piece rather than tracing it from dimensions, since there are pocket notches to take into account, but having to tape together two giant identical rectangles is a stupid waste of paper and time. And the lining isn’t even shorter than the skirt! … plus a bunch of grammatical errors in the French text, but you get the gist, it’s hard to follow and could have used some more thorough proof-reading. The construction itself is pretty haphazard. Rather than sewing the sleeves to the main fabric, and finishing the lining on the inside afterwards, the pattern asks you to fold in both the bodice and its lining by 1 cm, insert the sleeves in the middle, than topstitch them in place. I find this very messy, and definitely not easier for beginners. A few steps later, the skirt is closed in the round, then assembled to the bodice (which isn’t supposed to be a tube at this point, but I suppose you have to close the back seam as well…), then the back seam is unpicked with a seam-ripper to install the zipper in the center back. Sure, why not, except that they also instruct you to sew the skirt lining in the round to the bodice, and the back lining is just one piece, with no back seam. Oh and they never mention sewing the side seams of the lining either. You’re lost? Well I was too, don’t worry, the whole thing was like this. Complete mess. On top of that, my fabric was not cooperating. 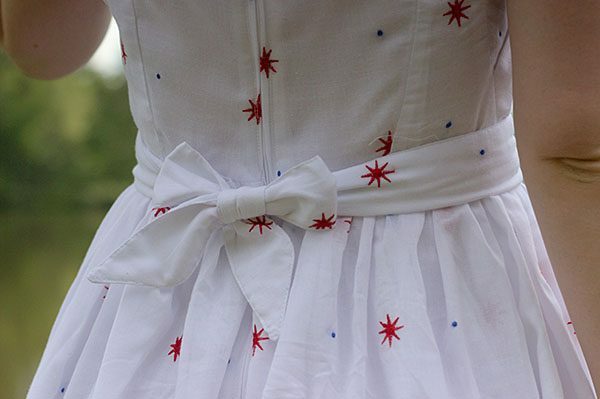 It was a lightweight cotton voile, found in a discount fabric store in Boston, and I thought it would be perfect for a July 4th dress (the red embroidery kind of looks like fireworks!). Unfortunately the weave was so loose that the seams would pull and pucker no matter what settings I used on the machine. It was also fraying like crazy, which was a nightmare with the 1 cm seam allowances. But I ended up finishing the dress eventually, sewing some parts by hand and improvising the construction as well as I could. And now it makes me so angry every time I see it! I’ve only worn it once and it’s currently at the back of my closet waiting to be donated. Yet when I see the pictures, I think the dress had potential. Sure, the cap sleeves make me look like a quaterback and it tends to fall down of my shoulders, but I think with a simple bodice width adjustment and sewn in a better fabric it could be nice. The drafting is good, after all: all the pieces fit together perfectly, darts end where they should, and the armhole overlap looks great. What was an issue was the “pattern object”: the layout, construction methods, anything that has to do with user experience basically. Drafting a good pattern is not the whole thing, there’s a lot of work afterwards to make sure that it can be sewn by actual people, which includes putting together a clear, correct, and complete instruction booklet. 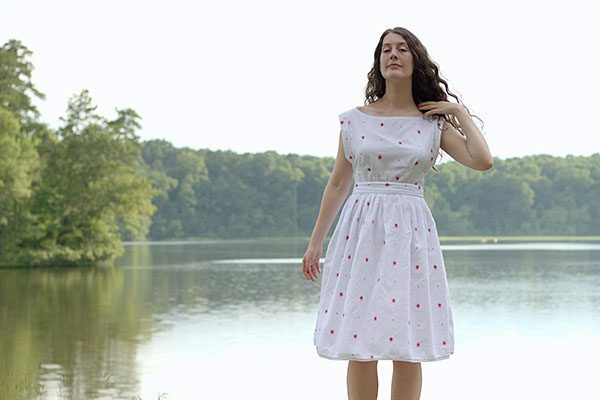 Maybe with Wear Lemonade patterns you’re only supposed to follow along with a video to sew your garment, and the instructions that come with the pattern are just filler. Except I don’t always have internet access when I sew, and I’d rather read instructions than try to catch up with a video in real time, always having to pause and rewind. Luckily for me, I am experienced enough that I can use only the pattern and line drawing and improvize the construction. So there is still a possibility that I’ll make a new Chiara dress eventually, once I forget how annoyed I was at the pattern. I also wanted to sew their Fiona overalls, but with this one I think I won’t evern look at the instructions, and also swap the center back zipper for an invisible side zipper, which should look better. Have you ever sewn with Wear Lemonade patterns? What was your experience? I’m sorry you suffered so much for this, but it’s refreshing to read such an honest review of a pattern! I feel like we can be too fawning of pattern companies sometimes, ignoring the faults, and it’s misleading for those of us who comb these reviews for guidance on our next projects. So thank you. I agree with Maggie—it may not feel kind to the person or company that produced the pattern, but giving critical feedback is so helpful to the sewists who might otherwise struggle for hours/days trying to fix something that isn’t their fault in the first place. Given the issues you’ve had with Chiara, what makes you want to try the Fiona overalls instead of one of the many other overalls/dungarees patterns, like Tilly’s Mila or Pauline Alice’s Turia? I like the style of the Fiona overalls much more: they’re more fitted at the waist and hips and remind me of the seventies, as opposed to other overalls patterns that often nod to the fourties and the whole “we can do it” look that is neat but not my style. I got the Jenny overalls from Closet Case Files as well, but the fit at the stomach is a little weird on most of the versions I’ve seen, so I’m procrastinating on that one too! Thank you for this frank review. I also share many of these concerns about WL patterns , especially the lack of pictures and awful instructions. I did make the Fiona dungarees, and did find the waistband instructions confusing (but I’m a novice so this could have been me). I love the finished garment and have made them twice with plans for more so would definitely urge you to have a go. The side zipper would be more accessible too. Oh that’s good to know, thanks! I recommend the Marguerite dress by Sew Over It, it’s a similar style but the instructions and drafting is bang on and easy to follow. Plus the think the sleeves are more flattering! I got so frustrated with this pattern too. It was my 2nd dress, so quite the beginner still, and it drove me nuts! The instructions were awful both in French and in English, I remember having to unpick the skirt from the waistband 3 times because it was all so unclear. The dress was a gift for a friend and the cap sleeves were SO ridiculously ginormous on her, I took the dress home with me to fix it. It’s been nearly 2 years… oh and I remember having to stalk instagram to see how to properly assemble them as there were no clear pictures/drawing in the instructions. I’ve also made their Julietta trousers and it’s really not better. The pattern calls for a regular zipper but they didn’t find a matching one when they shot the video, so gave instructions on how to put in an invisible zipper instead… and sent their users to the pattern instructions/video of their Carlotta shorts. Awesome when you don’t have said pattern. 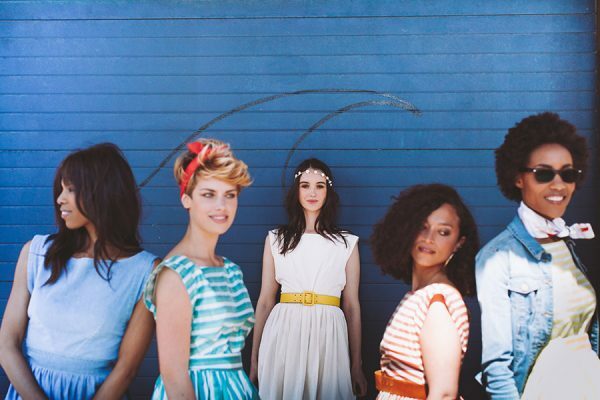 I love their clothes, but as you said, they’re a ready to wear company, not a pattern designer one. Oh man, that’s one of my pet peeves, when pattern designers assume you already own their other patterns so they don’t have to explain everything to you. A sewing pattern should self-contained: if you need to refer 100% of the users to additional resources, that info should be included in the pattern from the start!